Hello everyone! My question today is how often do you shop? I myself do not have the budget to constantly buy new clothes. I always try to stretch my creativity to wear a same piece in different ways. Today'a outfit is an example. 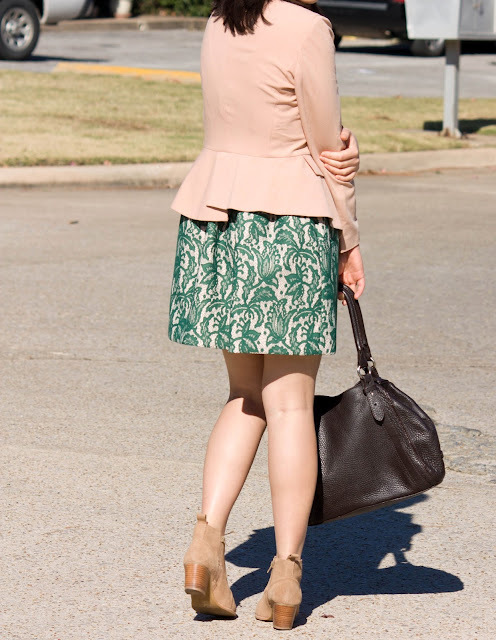 I revisited my old summer lace dress and pair it with a neutral blazer to create a fall outfit. Oh, I have the same blazer, but mine is from Chicnova. Love it so much. I love mixing and matching items in my closet to create new outfits. It's much less expensive than shopping! Love your pretty pink peplum blazer! Just found your blog and am following you now on GFC #251 and bloglovin! Check out my blog if you'd like! Thanks:)! the booties are super cute! Love this look too btw, I'm still on the hunt for the perfect neutral blazer! I have that same Zara dress in my closet. I think it is a great dress for Fall. I add a brown belt and colored tights for an Autumn look. Great post. Inspirational and chic.